I had the most interesting experience recently. I was asked by a friend to portray Mr. Jefferson at a seed conference. More than 100 gathered on the Great Plains to learn about the latest work in agricultural seed development. It’s a fascinating and even breathtaking enterprise — to manipulate what’s going on inside seeds to maximize production on America’s farms. One of the lectures was on something called seed chipping. This involves a very delicate machine that can chip off the tip of a seed so that we can study what’s inside without damaging the genetic material in the seed or its ability to sprout. If the seed in question meets the desired criteria it gets saved and propagated. If it has any genetic weaknesses or flaws, it’s destroyed. If you do this assiduously enough, you eventually get superseeds. The anti-Christian German philosopher Friedrich Nietzsche (1844-1900) spoke of the desirability of developing a nation of übermensch (the supermen) — just in time for Nazi race policy, by the way. Here we are attempting to create a superseed stock that will grow big, disease-resistant, insect-resistant corn, soybeans, wheat, sunflowers, even canola, which has a seed almost too small to see with the naked eye. This research is mostly being handled by the giant agribusiness corporations — Monsanto, Dow Chemical, Dupont, etc. That may shock us but it shouldn’t surprise us. But some of this research is being undertaken by land grant universities like Kansas State University and North Dakota State University. Your tax dollars at work. The Morrill Act of 1862 provided federal funding for agricultural colleges that would teach young people, especially farm children, to be productive and successful farmers. My friend, Wes Jackson of the Land Institute at Salina, Kan., argues that these land-grant universities have gotten in bed with giant agribusiness corporations, helped to spread the propaganda of “get big or get out,” embraced monoculture and genetic modification hook, line, and sinker and not only put the health of our national food supply in jeopardy but worked against the health and survival of the small family farms that the Morrill Act was created to serve. Be that as it may. When I was growing up, we used to go out into my grandfather’s field and pick a hundred ears of sweet corn in late August. When my sister and I shucked that corn on the porch, we found worms in at least half of the ears. Grandma cut around them and we still found the corn delicious — trying not to think much about sharing the harvest with worms. Today you almost never find that a worm has burrowed into an ear of corn. Why? 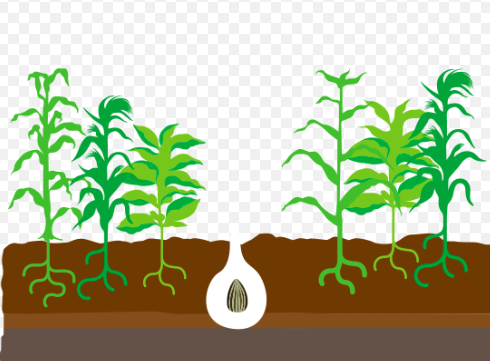 The answer is twofold: seed manipulation so that the seed itself contains chemistry that is disagreeable to worms and other predators, before the corn seeds are ever planted in the ground; and chemical pesticides used to spray the corn plants in the field when they start to produce ears. OK, well, that was my audience as the Third President of the United States. Now I am pretty sure Jefferson would be fascinated by genetic modification, seed chipping and much more in modern agriculture. You can see him flying a drone over his fields at Monticello but rewriting the user’s manual for Madison and his other farmer friends. It’s hard not to see Jefferson embracing virtually every emerging agricultural technology of our time. He’s the one who quoted Jonathan Swift with reverence. “Whoever makes two ears of corn, or two blades of grass to grow where only one grew before, deserves better of mankind, and does more essential service to his country than the whole race of politicians put together,” Swift wrote. Among many other benefits of modern industrial agricultural, the need for slave labor entirely evaporates. Jefferson would like that. The work of slaves is now done by the internal combustion engine and by gigantic and yet at the same time delicate machines that can pull all of the sunflower seeds out of a sunflower plant without damaging those seeds. But I still had something important to say to the society of seed chippers. I said that agriculture had — at least for men like Jefferson — two purposes. One, the obvious one, was food production. To say that on that score we have come a long way, baby, is a vast understatement. The historian and futurist Yuval Harari has argued that until very recently humanity had to give much of its energy to three great scourges: war, pestilence and famine. The last two have largely been made to disappear in the 20th century. Smallpox is gone. Polio nearly so. We are on our way to the eradication of Parkinson’s disease, MS, cancer, even dementia. We all know that is just a matter of time before we conquer diseases that have carried off billions of men, women and children in the course of human history on Earth. Food is now so abundant that Harari says that the scourge of the twenty-first century is going to be adult onset diabetes and obesity, not hunger. There is so much to respect and celebrate about the petrochemical-industrial approach to life. And we know that Jefferson would have been giddy with curiosity about all of these staggering technological and scientific developments. A man who saw four of his six children die in infancy, and a fifth as a young Virginia woman, could not possibly turn his back on modern medicine, disease control, and food production — and particularly because industrial food production solves the problem that has done more to destroy Jefferson’s place in history than any other factor — slavery. In other words, Jefferson would probably be chipping seeds. I told the assembled genetic engineers, men and women who are paid with my hard-earned tax dollars that food production was only one of Jefferson’s two agrarian goals for America. When he wrote, “Those who labor in the earth are the chosen people of God,” he was not thinking strictly about food production. Jefferson was also thinking about social utility. He wanted to live in a republic. He knew that it can only be a republic if the population consists of self-reliant, self-actualized, independent citizens. We don’t find those citizens in cities because there they are dependent on others — other individuals, and in our time corporations — for their shelter, clothing, water, power and food supply. If you are dependent on others to fulfill your basic needs, you are not really free. If the power company can shut off your electricity and heat at any time, then you have to vote for a system that keeps that from happening, and that may put you in bed with some very dangerous and self-serving Hamiltonians. If you cannot feed yourself — and of course feeding ourselves is the one the thing we absolutely must do — you can live without cello lessons but you cannot live without food — then you must vote for a system that keeps the flour and butter and corned beef flowing your way, no matter what that entity’s politics. That entity’s politics may call for prayer in schools, a ban on Muslims, the criminalization of homosexuality, and demand war against Iran or China. For Jefferson, the farmer is the only true citizen — at least in his own time — because he feeds himself (no grocery store required), shelters himself (no construction company needed), clothes himself (there’s the spinning wheel, there’s the loom, there is the Merino sheep waiting to be clipped) and warms himself (the axe and the crosscut saw are in the shed). A family farmer is not only largely self-sufficient in practical terms, even in the event of a worldwide economic collapse or constitutional breakdown, but by mastering the basic skills of living the farmer also becomes spiritually independent. Habits of independence, self-sufficiency, self-confidence and political liberty come from growing a garden, chopping wood, building a barn or a cabin, stripping an engine, rewiring the dairy tank, welding a trailer gate, butchering your own hog. I know such people in North Dakota. They do not live off of the grid — they are not from Salida, Col., after all! — but they would be able to live off the grid if they needed to, and they bring a level of self-sufficiency to daily life that reveals me for what I am — a creature at the teat of the military industrial cybernetical petroleum complex. When the gas stations run dry and the grocery store shelves are empty and the heat and light go off, I’ll be one of those victims whimpering in the corner, begging for a crust. I don’t even possess a gun that would enable me to compete for the last loaf of stale bread. Meanwhile, I have friends in North Dakota who would make the adjustment quite well — not without strain, but without suffering a nervous breakdown or collapse of the family. They would survive with dignity, because they have skill sets and tools that are alien to the rest of us. They might even vote to take me in as their house humanist, though I’m guessing there would need to be some stoop labor, too. And my old friend, Patti Perry of Marmarth, she really did more or less live off the grid, though she didn’t do hot yoga and make kale smoothies. Thomas Jefferson wanted a nation of highly independent, highly resourceful family farmers. The chosen people of God. He believed we would be a great nation as long as the vast majority of us were self-sufficient farmers, almost gardeners-plus. He knew that when we began to crowd into cities we would be helpless and our moral virtues would decay. And by cities, he did not mean Los Angeles and Chicago. He meant anywhere where the fruits of life come only through commerce, not through life skills and craft. So, if you are buying your chicken under plastic wrap, you are living in what Jefferson would call a city. Standing before a room of seed chippers, I tried to make the case for keeping the Culture in agriculture. Just before I was introduced, I turned to my friend in the room and said, “How many of them have drunk the GMO Kool-Aid. He smirked and said, “all of them.” Even so, as I warmed to my subject, I could see that they were intrigued, tugged back toward their roots on family farms, aware of the Faustian bargain we are all making. They were caught between feelings of shame, nostalgia, the romance of the family farm and some annoyance at the guy with clean fingernails — and in tights — droning on about the importance of having our hands actually in the soil. I wound up getting a standing ovation, though my old business partner, Janie, used to say, talk long enough and you always get a standing ovation, if only so they can bolt for the men’s and women’s rooms. But the three representatives of the big land grand universities did not stand. They regarded me as a kind of pitiful embodiment of something quaint and now essentially pointless in American mythology. When the Jeffersonian dream is reduced to nostalgia, you know you are in trouble. I so much miss my time in the garden, chopping wood for the wood stove. Self sufficient, no, but it got me back to the soil, where my roots are.